No parent should go it alone. Your gift today means they don’t have to. One more weary parent finding the hope they need to continue… One more set of hopeful parents committing the time to create a plan to aim their child’s heart toward God. And that “one more” child impacted by your gift becomes an entire generation seeking God as FamilyLife’s Art of Parenting™ gives more and more parents the tools they need. YOU can be part of helping 1 million families experience God’s transforming power in the way they raise their kids. We believe no one should go it alone. When you give today we will send you a 7 day prayer guide called “Praying for Your Child’s Character.” This guide will provide practical guidance for powerful prayers that you can be praying into your child’s life. How many families can you help today? 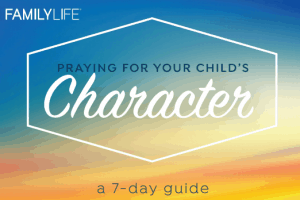 Please send me Praying for Your Child's Character, a 7-day guide. Thank you, but please do not send me the resources.